Obviously, Cherries are right out. So what was used on the tops of original lutes? The answer is probably, not much if anything. Modern lute makers use a variety of approaches to the tops of their instruments. I have seen no finish, egg whites/tempera, french polished shellac, natural wax, sprayed lacquer, and even a coat of ca glue (yes, super glue!). After trying a variety of approaches over the years I have settled on one very light coat of my 18th century style varnish oil. It is very light (doesn’t look like it is finished), helps limit moisture transfer with humidity change, and doesn’t seem to affect the tone. I will gladly make a lute without a top finish or with traditional albumin protein finish based on egg whites. That being said, I usually recommend a very light top finish of the varnish oil (especially on student instruments). For the bowl, neck and peghead I use a traditional varnish. Pictured: Instrument No. 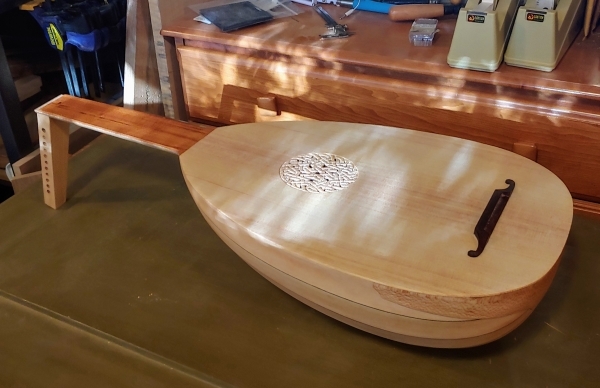 333, Six Course Renaissance Lute awaiting finish sitting on Justin’s 18th century style tool chest.